September 1939 saw the declaration of war with Germany. The Government of the day expected air raids to start immediately and was very worried about the safety of children living in the larger cities. In fact the bombing of London didn't start for another 18 months. My brother Barry and I, 6 & 9 Years old respectively, were part of that mass evacuation known as 'Pied Piper' which took place over the weekend of 2nd/3rd September 1939. I can't remember much about it but we ended up in Teignmouth and somehow finished up at Yannon Towers with the Martin family. I recollect that they were given the choice of taking on evacuees or having the property requisitioned by the War Office for military use. I'm still not certain whether they made the right choice. There were two other evacuees billeted with us, one from Lambeth the other from Marlow. My brother and I were from Sydenham in South London. You might be able to identify where the photo was taken from the surrounding building features. 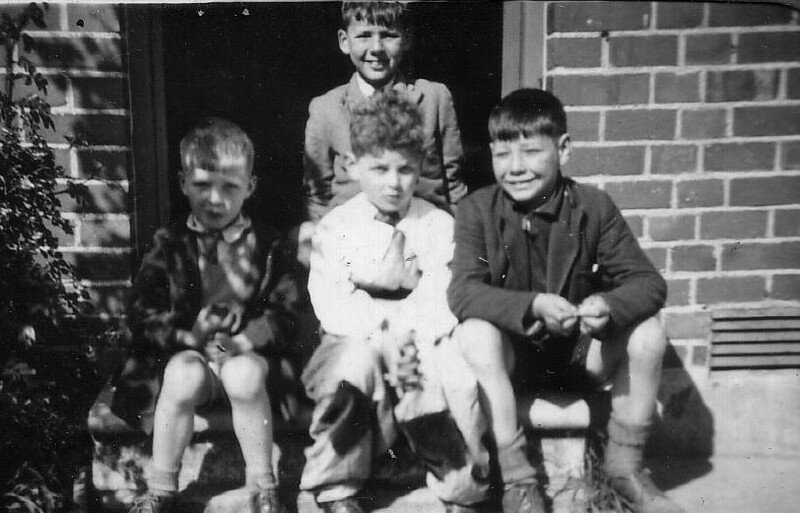 That's me at the back, my brother on the left and the Lambeth boy on the right, as you might have guessed, and it was he who got us into a lot of trouble, which I will touch on later. We had a Nanny to look after us, there was a Cook, I believe a Housemaid, and a Gardener. The grounds in those days extended from the back of the houses in Yannon Drive to Higher Yannon Drive. There was a paddock which ran the full length of the property on the south side. To the west and north were an orchard and gardens and from memory there was a long driveway leading to the front door with a lodge just inside the front gates leading onto Exeter Road. Initially we were all allocated beds in a large bedroom on the second floor. We ate in the kitchen with the staff members and were given a playroom, I can't remember where, could be through the door in the photo. All went well for a short while, until, under the influence of our Lambeth friend, we wrecked the bedroom during a major pillow fight. For our sins, the ring leader was re-billeted elsewhere and the rest of us were relocated to the upper floor of the tower where we remained for the rest of our stay. It wasn't very pleasant climbing those stairs to bed; because of blackout restrictions there were no lights and being impressionable young kids there were all kinds of monsters waiting for us at each turn. We survived, but became very homesick. The staff looked after us well but we had little contact with the Martins. They did allow us into the main dining room, but it was in order that the Housemaid could teach us to lay a table properly, and see how to serve at table. It seemed that for them there was no war, although it was brought home to them when their Naval Officer son got himself blown up by a landmine when trying to retrieve a golf ball which he had hit out of bounds. School, to which we walked each day, was in a church hall in town with a class in each corner. Weekends were spent playing in the extensive garden or walking to the beach and becoming ever more homesick. In the Spring of 1940 our mother came to visit us and saw how unhappy we were, and despite the promise of a car ride to Exeter and an ice cream by Mrs. Martin we were taken back to London. The bombing, which had been the reason for the evacuation, started 6 months later in September 1940. We remained in London for the duration of the war.